Hillary's email scandal reminds America what Clinton Inc represents: endless sleaze. To everyone's surprise, a scandal has finally broken over her head that Hillary Clinton appears unable to shake off: the discovery that, contrary to law and regulation, she used a private Internet server running in her basement for all her official emails during her term as Secretary of State. Apparently, she didn't use the encrypted, logged, archived government email servers even once, even though that's explicitly required for all government officials precisely so that Congress can perform its role of oversight. It's no surprise that Hillary ignored the law; that's always been a hallmark of both Bill and Hillary Clinton who believe that laws only apply to little people, not to them. It's startling, though, to think that the media realized that this scandal would probably have legs even if they ignored it, and thus are attempting to get it out early enough that it would be "old news" by the time the election rolls 'round. Of course, there are alternative conspiracy theories - such as, that the leftist elites think Hillary is too conservative, and would rather see a far-left socialist like Bernie Sanders or a well-spoken fraud like Elizabeth Warren get the nod. Most often, though, the best explanation is the simplest one: As unanimously leftist as they are, journalists are still journalists and can't help being drawn to the smell of corruption. Journalists may hide Democrat scandals on Page 37, but when it comes to make a choice between protecting a Democrat and furthering their own career by breaking a newsworthy scoop - well, it's a tough decision, but clearly some of them came down on the other side this time. In doing this, they are forgetting several important details. First, there's a great many young and low-information voters around these days, but there's no shortage of older people who have been voting for a while. Even the barely literate who were alive during the 90s remember Monica Lewinsky; some of them remember the Whitewater scandal and the rumors surrounding Vince Foster's death. The infamous blue dress even makes an appearance in current school textbooks! Do we want a return to the Clinton years? Most Americans would love a return to the Clinton economy and "holiday from history," but that's not really in the gift of a single election and we pretty much know it. The one thing we know for sure we'd get from the Clintons is the one thing that people didn't really care for about Bill's tenure: the constant stream of salacious scandals. Americans traditionally don't mind a President having an affair - most of them have - as long as it's kept private and not drawn out in living color in front of them. Bill's antics violated this simple rule and annoyed a lot of people. He didn't annoy them enough to put them off voting for Democrats, or even to not vote for Bill a second time, but he did leave a sick taste in many mouths when they voted. Not everyone will care about the contortions of that lovable rogue Slick Willie. 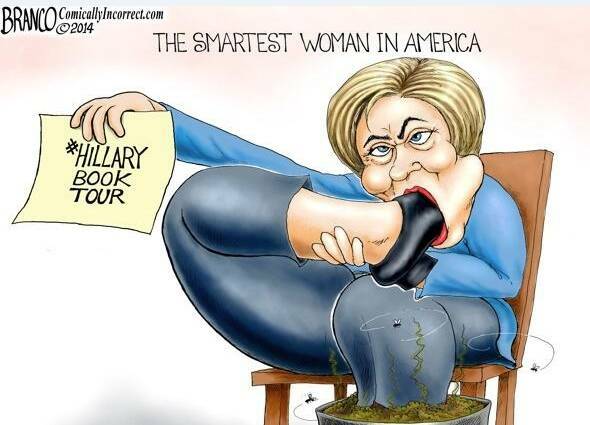 Hillary, however, is a different and far stinkier kettle of fish: unlike her better half, she has no charisma whatsoever. She looks, sounds, and acts like a harridan out of central casting - and if you say that's a sexist observation, then you're just ignoring reality and human nature. The Nixon-Kennedy debates proved that what a candidate looks like matters a whole lot; whether you think it ought to or not is irrelevant. This doesn't necessarily matter to the media, well experienced as they are in shedding the best possible light on their chosen anointed. When a scandal hits, though, it starts to make a big difference. Consider Bill's response to multiple accusations of affairs: a genial "Aw, shucks" air that makes you want to overlook or forgive the transgression. Compare this with Hillary's combative, aggressive, and blatantly phony attempts to respond. The few times Bill strayed into out-and-out lying as opposed to his more usual prevarications and weasel-words, it didn't end well for him, as in "I did not have sexual relations with that woman." With Hillary, everything that comes out of her mouth is of this sort. Bill Clinton is the living embodiment of the old Hollywood adage, "Sincerity - if you can fake that, you've got it made." When he told America, "I feel your pain," everyone believed him even though it was objectively untrue. With Hillary, does even her own daughter believe that she cares about her? One suspects not, considering that Chelsea said her maternal grandmother should have been aborted. Certainly, the only type of voter who could even for a moment think that Hillary cares about them is the shrill, single, far-left career woman who votes unanimously for the Democrat nominee whoever that may be. That's not enough to win a Presidential election; in a 50-50 nation, you have to garner at least a few votes from the other side to get over the top. The easiest way to do this is to con people into thinking you care about them. Bill can do this in his sleep, and Hillary cannot do it even with the world's finest consultants and decades of practice. Let's be clear: our current crop of Republicans do not deserve to win. For John Boehner's disgusting performance so far this year, the Republicans deserve to lose control of Congress entirely. If we are to have leftist lawlessness and tyranny it may as well have the proper (D) after its name. On the other hand, the Republicans don't seem to have quite the same reputation for corruption and sleaze as the Clintons. In a very frightening era, with the world order falling apart and the economy going nowhere fast, people would like to think that the man at the helm at least tries to tell the truth. Which, more often than not, Republicans do. This is perhaps because they're too stupid to come up with a passable lie, but even forced honesty counts for something when it comes to politicians. The American voters handed the Democrats a historic shellacking in 2014, booting them out of more seats and local offices than ever before in history. Clearly, America is not enamored with Mr. Obama's job performance, his policies, or the people he surrounds himself with, although somehow most people still find him personally likeable. If a Republican can come up with anything resembling a coherent vision of how to reach "Morning in America," he'll win in a landslide as everyone to the right of full-bore feminazis abandons Hillary the Hag. And if not? They may squeak through anyway. How often can we say that? But we'd rather have a clear choice, and see America make it. Dunno about lawlessness, but when it comes to tyranny, there's been a big shiny R after it for a good while now. TSA, DHS and friends are the most clear examples of tyranny any modern-day American has seen in his lifetime. Those agencies were all designed, created and promoted by the Rs, not the Ds. I also don't believe that the Republicans try to tell the truth for the most part any more than the Democrats. That is the residue of some GOP image from decades ago. Modern day Republicans are just as deceitful, misleading and hypocritical as anything going on on the other side. I do agree that if Hillary runs, someone on the right can defeat her and that's saying something since the right has all but lost the future of American politics. Aside from the baggage, which is significant, Hillary has no appeal among black or hispanic voters. I think most minority voters despise the Clintons. She is also hated by the left side of the party and for good reason. While it's been received wisdom for years, I've never understood why her Presidency was also considered inevitable. She has a very small voting base. Nearly every one else, outside that "shrill single career woman" as the writer puts it, would have to drag themselves to the polls to vote for her and would only do that if they hated the other guy more. Those types of we-have-to-because-the-other-guy-is-worse candidates (McCain? Kerry?) never do very well. So I guess I agree, somewhat, with the theory that the media wants to torpedo her because they think she is a bad candidate. It may not be a conspiracy exactly, but I'm sure they understand the problem.